Spend a Sunday afternoon with Little Plant Shop and The Holy Roller, sipping cocktails and creating your own terrarium! Your ticket includes all the supplies you'll need to make your terrarium, instruction and inspiration from our neighbours at Little Plant Shop and one of our signature cocktails. Space is limited so grab your tickets HERE today! Join us for the Imagine Okuda Fundraising Dinner featuring a Globally inspired 6 course dinner carefully prepared by chefs: Sammy Chalmers from Holy Roller, Shane Chartrand from -SC- at River Cree, Lindsay Porter from London Local, Jason Barton Browne from Hayloft, Eric Hanson from Prairie Noodle House, and Chef Medi from Buco. More information and tickets HERE. 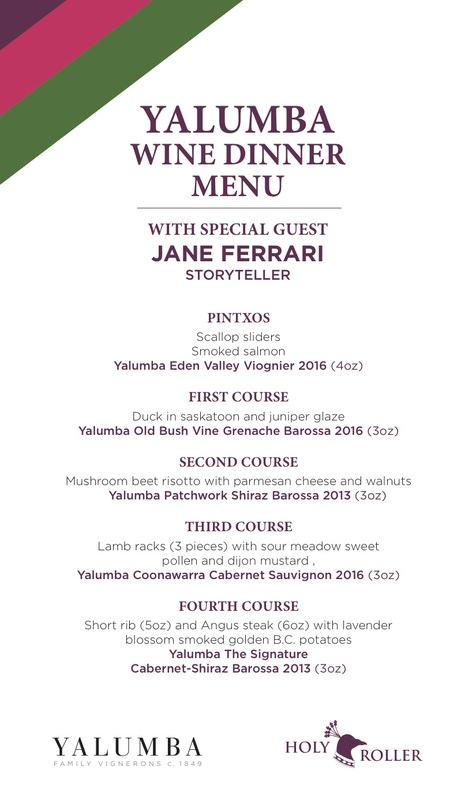 Join us for an evening with Yalumba wine ambassador Jane Ferrari. You'll enjoy a reception and a four-course meal, each paired with a different Yalumba wine. Tickets are available at Eventbrite. Ferrari, a winemaking graduate, joined Australia's Yalumba Wines more than 30 years ago. The winery, founded in 1847, is located in Barossa Valley, which is similar to France's Rhone region. Yalumba is one of only four wineries around the world to make its own barrels. "There’s no fake or frippery with Ferrari – when she preaches the Yalumba gospel, you realise that she’s doing it because she’s passionate about the place; she leaves the distinct impression that she wouldn’t waste her breath on anything she didn’t wholly believe in herself. Meeting Jane Ferrari is unforgettable. Her job title at Yalumba is multifaceted. She is a storyteller, a communicator, a brand ambassador, a legend. Spend an hour with Jane and you'll find out more about the heritage and culture of Yalumba and the Barossa than most locals learn in a lifetime." We're launching our weekend brunch service with a special Mother's Day celebration on May 13 from 10 a.m. to 3 p.m.
For reservations, call: 780-540-4659 or email us at holyroller@merchanthospitality.com.